BONTOC, Mt Province – Fifteen campus sports stars amassed four gold, three silver, and five bronze medals in the just concluded Mountain Province Athletic Meet held last December 2-6 here. Said medals were hauled from swimming, table tennis, and taekwondo of which these athletes had represented the Sabangan municipality in this year’s provincial athletic meet. Freshman Louie Nor Calag posted two gold, a silver and bronze medals all in his swimming event, Junior Kurt Teng-eg added another gold and a bronze medals in same event, and Junior Reese Bondad in table tennis. Other medalists include seniors Kristal Moises and Glen Mar Puyongan who both fetched silver medals in table tennis, and junior Joy Challeg and freshmen Michelle Awao and Roselle Cacap who hoarded bronze medals in taekwondo. Other campus athletes who joined the SAHS team in this annual sports drive were Kurt Karyl Pilacan who landed third in his braket in the table tennis singles; Jhona Mae Layong and Shirley Gittabao in volleyball; Loven Tabora and Mark Neil Daclili in Badminton; Giovanni Likigan in chess; and Kerwin Samidan in Swimming. It ha been a tradition that SAHS athletes were consistently fetching gold medals yearly in these events as evidenced by quality training programs realized in the school. Meanwhile, gold and silver medalists will join in the Mountain Province delegation for the up-coming Cordillera Administrative Region Athletic Association (CARAA) meet that will kick off on February next year in Baguio City. 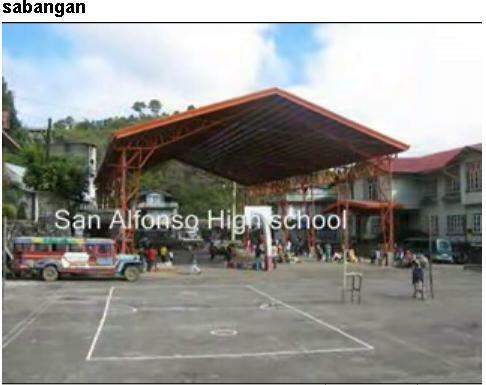 SABANGAN, Mountain Province – Efforts of San Alfonso High School faculty and administration in collaboration with the Parents Teachers Community Association paid off making the school now connected in the internet. The internet connection project was realized when parents of this school deicided to increase the monthly computer fee to finance the internet services and other incidental expenses and materials needed. Mr. Rodolfo M. Pepe Jr., the school principal disclosed in an interview that this undertaking means growth and expansion in the school’s curriculum which gives each student full access with the internet essential in the school's various programs. According to the principal, this endeavor is the missing link in connecting students and teachers in the modern fashion of teaching-learning process at hand which at par a modern breakthrough in most schools in the international community. Furthermore, he said that the connection at the spur would help hook up the school family and the alumni necessary in the success of the most awaited school’s golden jubilee celebration next school year. “I am happy to learn during the first PTCA assembly held last June that parents themselves reveal interest in the development of the school’s academic programs through the wire services. If truth be told, this consideration facilitates whole classroom instruction, school’s communication, online services, library growth for electronic research resources, and much other enrichment,” Mr. Pepe said. Areas in the school where internet services were installed include the computer laboratory and library, faculty, and the principal’s office. In related development, the school staff had launched the school website as a dialogic tool to cater to students’ services such as online collaboration between students and teachers during the weekends and vacations. The school website can be accessed at www.sahs-edu.page.tl. Move ahead…skillful technologists and entrepreneurs was the guiding theme of this year’s STEP district wide conference. From yesterday’s events, one can really see qualities of excitement, enthusiasm and readiness as blest by perfect weather state. For all we know, this 3rd STEP aims to develop among students from the different secondary schools in this municipality become active partners in nation-building and to achieve competitiveness and productivity through different skills. One as speakers disclosed only common points to wit, this 3rd District STEP confab prepares the young not to become an employee but to become an employer. The passion of realizing this event had really opened immense avenue for this group of young to become sensitive of grabbing underlying opportunities ahead relative to the preparation this said conference has to offer. Enhance not only the technical know-how of the students but also develops best interpersonal skills. Strengthen ones skills in Technology and other related Livelihood programs and to establish more linkages with government agencies like that of the TESDA who offered us their service for trainings in preparation for tougher challenges ahead. This year's theme “Move ahead…skillful technologists and entrepreneurs" puts a premium on the participation of school-based organizations in disseminating and realizing the observable skills and knowledge on the technical and vocational related aspects of education. I would like to mention the generosity of the participating schools from Sabangan National High School – main, Sabangan National High School – Data Annex, Pingad National High School, Namatec National High School, and the host San Alfonso High School. Areas considered in the Skills Development Program were Agricultural Technology, entrepreneurship and ICT integration. One school specifically the Sabangan National High School – Data Annex showcased their skill in parliamentary procedure that was processed and critiqued by personnel from LGU Mr. Theodore Velasco. This day, we are looking forward for the group of San Alfonso High School in this event to be processed by same speaker and facilitator. Other areas of skills competition yet to be conducted include home economics and technology and the techno quiz. Of them all, these areas aim to mainstream technical-vocational education in both public and private schools and increase technical aptitude among the students. SABANGAN, Mt. Province – The Ecological Solid Waste Management Board of this municipality had fortified its agenda in waste management programs that heightens its policies in this concern as discussed in the meeting conducted last June 26 at the Municipal Hall here. Forty members of the board had rekindled their environmental interest in valuing measures relative to the management of the solid waste materials that is in line with the RA 9003 urging all government units nationwide to align its clean and green programs in all the provisions stated therein. Hon. Donato L. Danglose, the municipal mayor disclosed that the creation of the municipal ordinance 2005-02 series 2005 which is the “Comprehensive Solid Waste Management Ordinance of the Municipality of Sabangan” was in response to such Republic Act in setting guidelines and targets for the handling of solid wastes in the municipality. According to him, such effort in designing this local solid waste management agendum ensures proper wastes segregation and disposal which spells institutionalization of public involvement on environmental awareness for Sabangan municipality in its bid for the cleanest and greenest municipality in the province. In his statement, said Act was the basis for the possible realization of the municipal ordinance designed to meet the provisions identified in the Act in adopting best environmental practice in ecological waste management which discouraged incineration method. “This is but an exertion in complementing techniques for the treatment and disposal of solid waste by way of formulating resources in response to the challenge. Failure to implement the Act could be a ground for administrative case against any head of town/cities or province,” the mayor said. In related development, Mr. Theodore M. Velasco, the Municipal Solid Waste Management Action Officer revealed in his letter invitation the calendar of business of the said meeting to wit; review of the board compositions and functions, presentation and review of 2008 Action Plan, zero cellophane waste campaign project appropriation of the PhP 50,000.00 fund in the AIP, designation of the Barangay and school solid waste management action officers, task working group for the quarterly monitoring activities, and the regular meeting schedule were discussed thoroughly. In the general action plan which he designed and discussed, the Ecological Solid Waste Management had underscored categories on reducing, re-using, recycling, marketing, collecting, and disposing skills that had identified specific measures in handling solid wastes as far as engineering, education, monitoring and enforcement, accounting, and the sustainability and livelihood are concerned. Resentments are but obstacles to ones life and an effort to cast out these inner adversities boosts faith in ones self in light with the Christian teachings, Rev. Fr. Benedicto de Guzman, the retreat master and an assistant chaplain at UP-BGH stressed before 170 teachers including the principals from the Mountain Province and Ifugao Vicariate Schools during the two-day healing retreat seminar held last June 18-20 at Teng-ab, Bontoc. Said retreat had exposed the participants on technology of St. Ignatius of Loyola, personal individual prayer, ten commandments for a close friendship, definition of weaknesses, sins, frailties, and addictions as an instrument to widen teachers’ calling on their career as facilitators in the Catholic schools at hand. Fr. De Guzman, who had been into retreat services even before becoming a philosopher underscored deeper sense of encountering Jesus in ones daily endeavor by way of giving quality relationships with Him as the greatest teacher of all times. Accordingly, bruised, broken feelings, unexpressed desires from the evils of the world need to be healed. To such, this retreat seminar among teachers usually came at the beginning of a school year in an attempt to bind them in one vision-mission to start a school year, besides serving as form of renewal of camaraderie among the group. SABANGAN, Mt. Province - An effort to involve the young in the Basic Ecclesial Community (BEC) thrust of the church was initiated successfully by the youth ministry of Sabangan Catholic Mission which was held last June 15 at Saint Joseph Seminar Hall here. This was in response to the foregoing programs of the vicariate’s youth ministry in realizing resources to engage the young in the varied church activities which were organized as early as April this year by Baltazar Robles, one of the Youth Ministry Staffs base in Teng-ab, Bontoc. Kurt Karyl Pilacan, one of the resource speakers and a fourth year student of San Alfonso High School, Sabangan disclosed that a total of 32 elementary pupils and high school students attended the orientation that talked about the functions of the YEAST ministries in the BEC chart. It will be recalled that in the BEC scheme of the Church, YEAST refers to the youth, education, altar, social services, and temporalities ministries as the Church pushes concrete realization of the communitarian model by the Second Vatican Council. BECs are regarded as a new way of being church – the Church as the grassroots and the people participate actively in the priestly and prophetic mission. Such program was intended and designed for grade 6 and high school levels to assume the role of youth in the YEAST ministry in light with the social teachings of the church. “First and foremost, the orientation we had last Sunday is an attempt to involve the youth in the various Church activities. In this way, I believe that their potentials and interests are maximized fruitfully,” Kurt Pilacan said. Speakers of the said activity include Kurt Karyl Pilacan, Arius Mamanteo, Aiza Boguilis, and Arnoldyn Sally all from San Alfonso High School; Hannah Pacyado, and Roberto Pangpangdeo from Sabangan National High School. Sabangan. Have you got problems with hypertension, cholesterol build-up, cancerous cells, heart diseases and hardening of the coronary artery? Not anymore a problem as the Gano itouch Philippines Incorporation – La Trinidad based marketing made effort to bring Ganoderma products closer among the villagers in this province. Mr. Edwin Caparoso, the marketing director made mention during the medical outreach in Sabangan last week of the Ganoderma’s healing power as cleansing stuff to regulate asthma and high blood besides its proven treatment to major diseases mentioned. Ganoderma is said to be able to improve the body’s healing ability, maintain a healthy body and promote longevity, beside its power to help the body function more effectively, efficiently and optimally as it was been shrouded in mystery for more than 2000 years. “Our coming here in Sabangan is our own alternative to reach out the wonders of Ganoderma in the Mountain Province in the multi-level marketing. This is our own initiative to advertise such products to somehow extend health concerns to the people,” said Mr. Caparoso in the interview. The main raw material of the products makes use of the red mushroom best raised in Malaysia because of the soil chemistry, temperature and the general topography of the place. Such mushroom can flourish to other places like Philippines but its rate of growing, quality, and the like clash with those produced in the place. Products’ prize usually in the form of food supplements and vitamins, and cleansing coffees range from PhP 200 to thousands. Prizes differ at rates depending on the volume of the packs one desires to buy and discounts are offered to members at 10 to 15% cut. Earlier this month was the team’s successful conduct of same medical mission in Tadian and is expected to kick off another undertaking in Besao this weekend. Accordingly, the eagerness of the people as manifested in their interest to keep in touch with the products made the group to keep treading Mountain Province in this calling. It is noteworthy that there are communities, particularly in the northern and southern regions of the country have retained and continued to live their indigenous cultures despite heavy and unrelenting inroads of westernization and globalization. Among these groups are the Igorots in this province. To the extent that substitution, assimilation, accommodation, retention of indigenous and western cultures is possible, there is relative harmony and peace in communities and among peoples. The resiliency and leadership of the old and the new way influenced the situations of culture change. It is noted that in Mountain Province itself, customs and traditions continue to influence the manner, but do not have the monopoly, in which dispute settlements, peaceful negotiations and social inter-relationships are conducted. Dr. Dominic T. Gaioni in his study on the indigenous concept of health and diseases in the communities of Bauko, Bila, and Otucan concluded that the Igorots in the areas studied conceived health status as a permanent condition of equilibrium which has physiological, ecological, medical, nutritional, and psychological dimensions. An important aspect of the Igorot culture related to health is the observance of social and ritual norms and taboos. Every Igorot society is governed by rules and norms aimed at regulating the flow of interpersonal and intercommunal relationships. His findings show that some Igorot customary laws have a connection with health concerns. Thus, the observance of customs and traditions in everyday life is believed to guarantee health, while transgression of the same or thought to bring about illness or even death. He also stated that the well being of a person is dependent upon his relationship with the spiritual world specially that of eco-spirits and kin-spirits. As such, health may have to be secured and proper relationships be restored by divinatory and ritual practices. In like manner, Jill Gale de Villa disclosed that every aspect of Cordillera life was under the sway of a large body of gods, demigods, and spirits associated with places, objects, planets, animals, and deceased ancestors. As such, everything of any significance in life was sanctified with prayers and formal rituals to avoid problems, which they believed were due to deficiencies in handling the spirits. Harvests would be plentiful, marriages fruitful, journeys rewarding, illness cured, new houses safe only if the spirits were properly propitiated their favor and assistance gained. To invoke the favor, rituals usually involving costly animal sacrifices were performed. The responses of the spirits were ascertained by reading the omens indicated in the color, size, shape and position of the bile and the liver of sacrificial animals and by observing other natural phenomena such as the appearance of a bird or a snake crossing one’s path. In case of unfavorable omen, the planned activity had to be cancelled or delayed and more rituals were performed to gain the favors of the spirits. De Villa further noted some activities considered taboo which might bring the spirits ill will upon a people or a community. One instance is the prohibition against going to the field during a declared rest day. Violators were punished by fine for minor rest days, and death in major occasions, when it was believed that transgressing the taboo would result in crop failure. In related development, Dr. June Prill-Brett noticed that the role of ritual as mechanism for coping with agricultural is deeply embedded and very evident in the Bontoc culture. For instance, religious beliefs and rituals performances give farmers confidence and some feeling of control and security over their daily encounters with unpredictable natural phenomena. These rituals emphasized the relationships between farmers, the biophysical world, the social world and supernatural world. Likewise, rituals reinforce the coordination of agricultural activities that must be accomplished within a specific time frame to ensure good harvest and to minimize risks caused by environmental stress. In her research on the Pechen, she pointed out the relevance of this traditional peace negotiating process to the everyday life of the Bontoc people. She concluded that the Pechen took center stage in the matter of settling boundary disputes and inter-village conflicts that resulted in the loss of life. Violent death to any village member always drew the Pechen into the daily and constant consciousness of every village member. While culture play some vital role in the society at hand, many good aspects of our indigenous way of life are now fast disappearing due to some factors such as the development in Science and Technology, influence of western culture, lack of interest on the part of the young generation. Specific example of significant change in the social system is the adoption of cash. Reciprocal labor exchanges are now replaced by paid labor since some of the farm owners are employed outside the village and cannot reciprocate the labor exchange. Traditional social relations are beginning to be undermined by the introduction of a cash system. As a consequence of the above changes, there is a noticeable decrease in village solidarity and self-sufficiency. Such factors for change include formulation of government’s national laws and institutions like that of the 1991 Local Government Code which set up the “Lupang Tagapamayapa” as a conciliatory panel, formal education which has changed the whole social structure of the places, Religion which promoted Christian doctrines of forgiveness and reconciliations, money and influence because fines and penalties are now computed in Philippine peso rather than the former carabaos, rice fields and heirlooms, non-transmission of oral tradition due to the disappearance of the Ato and the apparent disinterest among the young and finally due to the inter-village marriages where two villages become one. The Schools of Living Tradition (SLT) trademark remains in the identity of the private schools in Mountain Province as the bearer of the living culture, interfacing the school’s curriculum with the traditional and indigenous processes. SLT teaches skills and techniques in doing a traditional art or craft. Initially, the mode of SLT teaching was non-formal, oral, and with practical demonstrations. But the SLT was reinvented and re-defined by the mission schools in the Bontoc-Lagawe Vicariate. This re-invention deeply integrated culture in the academic curricula. In line with the UNESCO’s call for the preservation of cultural heritage, some mission schools in the vicariate has fashioned its academic curriculum in order to align some areas of disciplines with culture – taking culture itself as tool in realizing learning goals in the four corners of learning. Through SLT, culture is learned and preserved. The traditions and culture is passed on to the next generations and are practiced and applied in everyday life. The successful conduct of the first and the second SLT Conventions that were held in Bauko Catholic School and Saint Vincent’s School in 2007 are proof that the various traditions and creative expressions of the Igorots are truly a dynamic part of the province’s way of life and cultural identity. The SLT conventions showcased the authentic traditional practices in areas such as Tadian, Bauko, Sabangan, Bontoc, Banaue, and Lagawe. Such traditional practices were featured and performed in the schools’ various extra-curricular activities. To further develop SLT and study the role of culture in the academe, teachers in Mt. Province have designed learning packages vis-à-vis the standard learning objectives of the Department of Education. Some of the studies made were: “Customs and Traditions of Western Mountain Province Necessary in the Peacemaking Process” by the teachers of San Alfonso High School, Bauko Catholic School, and Holy Rosary High School; “The Relevance of the Og-Ogfu as Practiced in Bontoc ILI” by the teachers of Saint Vincent’s School; and “The Traditional Practice of the Bogwa” by the teachers of Saint Joseph School of Kiangan. These studies stirred new concepts in teaching strategies: Why not make use of the “tapis” and other indigenous materials to study lesson in Mathematics such as perimeter, area, or volume? Why prioritize the study of the history of the United States when there are hundreds of unsung Igorot heroes in the land? Why not study Igorot poetry as well instead of just focusing on the English language? Through their collaboration, the schools realized that there are other ways in which students can realize the concept and value of SLT. Aside from teaching Igorot dances, or playing indigenous musical instruments and sports such as “kadangkadang,” “inagto,” “inetaan,” “sanggol,” “bawwet,” or “ap-appayek,” students can also learn traditional cooking other traditional arts and crafts. Indeed, the Schools of Living Tradition identify the aspects or components of our traditional culture that are considered important to our cultural community and should be imparted to the youth so these values and traditions can be perpetuated. To some, culture may be hindering factor to development – the process of preserving the culture and adhering to the usual practice may crash with the rising technologies and scientific advancements. The role of the Schools of Living Tradition is to merge culture with progress, embracing traditional practices while investing on advancements as well. The SLT’s learning goals include revitalization and reinvention of the customs and traditions which are culturally rooted yet globally competitive. SABANGAN, Mt. Province – The youth are the strong collaborators in bringing moral-spiritual reform to the country relevant to the Catholic Bishops Conference of the Philippines’ (CBCP) call for personal and communal conversion towards social conscience; Most Rev. Rodolfo F. Beltran, the Apostolic Vicar of Bontoc-Lagawe stressed in his message as the 400 youth participants from the different municipalities of Mountain Province and Ifugao treaded the four-day youth forum held last April 24-27 here. Bishop Beltran further underscored the strong links among youth for their initiative in organizing this eventual forum which had exposed them to the pressing problems besetting the country today. Moreover, Youth Ministry Coordinator Sister Anita G. Inyat of the ICM congregation disclosed that this forum was conceptualized to re-echo the offshoots and the learning experiences one had gained from the Northern Luzon Forum held last Oct. 20-26 last year in Vigan City, Ilocos Sur. Accordingly, this youth forum had exposed the participants tracts on social teachings of the church, Basic Ecclesial Community (BEC) and youth ministry, human sexuality, ecology, prayer and devotion, respect for life, responsible governance, and vocation hour which were the pressing resources needed by the participants in knowing themselves and in reaching out their inclination and leadership in the community. “After this event, I expect that the participants will do the same process, to re-echo in their own parishes or BECs the outcome of this gathering,” said Sister Anne. Personalities from the Vicariate’s Youth Ministry Fr. Bento T. Tamang, director; Ms Nellie Pandogas, Vicariate Youth Leader; and Sister Anita G. Inyat, Youth Ministry Coordinator did organize this event in an effort to bridge empowerment and the role of the youth in the evangelical mission. Likewise, Mrs. Virgie A. Sally, the president of the Sabangan Mission Pastoral Council revealed strong indicators of success of this forum as manifested in the kind of services rendered and thorough conduct of the events. She further stressed that the Sabangan community displayed resilient teamwork by way of giving cash and in kind donations besides the assistance held out in the preparation and restoration tasks. Meanwhile, speakers of the said forum include Most Rev. Francisco Claver, Fr. Bento T. Tamang, Sr. Anita G. Inyat, Fr. Victor de Guzman, Mr. Jean – Robert Escher, Fr. Marcial Lloyd C. Castañeda, Mr. Jose Descallar, Ms. Febe Sally, and Fr. Vincent Mynem C. Sagandoy. BAGUIO CITY – Around 35 private school teachers from Mountain Province out from 275 total registered participants in the whole Cordillera region attended the three-day Education Service Contracting –In Service training (ESC-INSET) conducted last Thursday at Teacher’s Camp here. Ms Caroline C. Porio, the National Executive Director of the Fund for Assistance to Private Education (FAPE) stressed four pillars of effective teacher to wit; effective teacher cares deeply, recognizes complexity, communicates clearly, and serves conscientiously. According to Ms Porio, the FAPE is an active institution for 40 years contributing assistance to the challenges uprising in the private education, creating major legislation in the contracting services in the Philippines before it was put into law in 1989. Moreover, she disclosed that an effective teacher is a teacher who is sensitive enough to know the background and environment of his/her students in an effort to facilitate guidance services; a teacher who matches his/her skills with the students to meet the challenge and demand of education at hand; a teacher who makes clear instructions, classroom management, orientation, learning goals; and a teacher who dedicates his/her time and energy in ones profession without expecting much in return. “Education is no longer confined in the four corners of the classroom. It is already within the click of fingers as enhanced by technologies at present in the global community,” Ms Porio said. On the other hand, Dr. Corazon B. Dacawi, the Regional Coordinator of the ESC CAR revealed that this year’s INSET aimed to upgrade and improve teacher’s competencies within the learner’s environment in the Mathematics, Science, English, and Social Studies areas of discipline. Accordingly, such INSET is a retooling service for teachers in the region’s private schools which helps them reach out the best kind of education in the four corners of learning and in the global community. Meanwhile, resource speakers in this training include nationwide personalities in the persons of Honeylein C. Peralta, Raymund Santos, Zenaida Valdez, Jona Valente, Ronie Bonao, Erlina de Peralta, Maria Gagto, Julius Gat-eb, Teodolo Blas Jr., Aurelia Molave, and Mary Grace De Leon. This INSET agenda is an annual round table initiated by the FAPE-CAR in response to the innovation process the schools want to adopt for the teachers to cope up the fashion of learning today. In related development, participating schools from Mountain Province include teachers from Bauko Catholic School (Bauko), Holy Rosary High School (Tadian), Immaculate Heart High School (Natonin), San Alfonso High School (Sabangan), Saint James High School (Besao), Saint Mary’s School of Sagada (Sagada), and Saint Vincent’s High School (Bontoc). After so many years of slumber, the NAMBAYO falls located in the Napua’s northern part has roared to life as source of inspiration for explorers, travelers, artists, authors, residents and visitors later than its recent breakthrough as one of the local tourism spots in the municipality of Sabangan. It is named after the perfect sound reverberation of rice pounding one can perceive within the vicinity of the falls. Its waterfall retreats upstream river runs to about few meters resembling a perfect view of a horsetail type falls that spreads to 3 to 4 feet across two big rocks. The other rock resembles a face of gorilla doomed to safeguard the place against any form of abuse and other unwanted event that may crop up anytime. Further, it plunges into a clear drop of approximately 30 to 35 feet tumbling over cascades to form a plunge pool measuring to a ballpark figure between 60 to 70 square meters during dry season. Such pool stretches to twice itself around 150 square meters during rainy season. The deepest part of the plunge pool measures to 4 to 6 meters deep found at the center, a little bit whirling like small eddies accumulating inward. The 90 degree vertical cliffs of the escarpment with its rocky and steep slopes appear in lush covered side by side by fascinating gorge. The gorge is sheltered and stays moist with mist naturally during rainy season. The sound of the medium sized falls and the cascading water vapor cloud on its side drowns out public noise that serves as the inspirational music in this primitive and uniquely beautiful area. The area is still rich with second growth hardwood forest comprised of pine trees, grasslands and mixed forest communities. A former Barangay Kagawad Mr. Paul T. Mamising used to get into the site during his childhood days. He disclosed that the falls stood customarily in three falling towers in series. But due to immense succession and geological processes, the falls narrowed down to only one main cascade with two small falls straddling on its side with the other one producing vaporize water smoke. Accordingly, the falls was once a swimming pool of YUNGA-AN, one of the primitive settlers in the area who luckily amassed two baskets of WADING (typical fish) in one night with the help of the believed nearby ANITO present that time. From the Halsema highway in Tabbak, Namatec, one can readily traverse the 60 degree sloping mountain side for 2 to 3 hours hike before getting into the site proper. The long, narrow and winding path draws out across the panoramic mountain views by five to six kilometers in which one can really feel the natural draftiness of the place. Other route in getting into the site is via Malaslassa, one of the sitios of Barangay Napua where the ride can reach that far trimming down the excursion time by an hour. Nambayo falls as it should be is a perfect spot to accommodate leisure for photo art works; eco-walk voyage; swimming; picnic outing; and as fishing grounds for WADING, tadpoles, and other forms of aquatic life present. It feels great to visit the place, enjoy the outing with the richness and wanders of nature. Nambayo falls is an expression of the Almighty’s loving touch; idiom of ones passion to nature; manifestation of appreciation to beauty; and avenue for physical, social, and mental exercises. The success and failure of the learners in their academics depend on teacher’s employment of the different learning styles and strategies. Further, learners’ performance in the classroom is affected by the external factors like home environment, teacher’s methodologies, personal motives, and other causes of such failure. Learners learn at different speed because of the effect of diverse culture and individual differences. In general, there exist three main causes of students’ failures namely: parents (family causal factors), teachers (academic causal factors), and students (personal causal factors). Further, failure among students in some other extent sometimes came from teacher’s factors. Amparo S. Lardizabal pointed out that the autocratic teachers might end unsuccessful because of poor classroom management. Such poor management is the inability to understand the learner’s unique individuality in the learning process. Research findings show that democratic teachers produce better learning results than those who dominate, control, or manipulate learning situations. Teachers should determine the psychological needs of their students and adapt their teaching styles accordingly. Specifically, the author himself has conducted a study about causes of students’ failures in the five vicariate high schools of Mountain Province namely Immaculate Heart High School in Natonin, Saint Vincent High School in Bontoc, San Alfonso High School in Sabangan, Bauko Catholic School in Bauko, and Holy Rosary High School in Tadian. In view to the problem stated on the outset of this research, the following were the most salient findings: Both students and teachers agreed positively to a significant degree on poor study habits, lack of personal discipline, and to some extent truancy, emotional disturbance, lack of capacity necessary for high school works as indicators of failures. Moreover, first to third year high school subjects that revealed the most number of failures were in Mathematics, Science and in English areas of learning. In response to these inevitable growing factors of failures, the school teachers and administrators were urged to design programs that would somehow trim down such obstruction, to wit both teachers and the parents should find time to supervise and follow-up the schedule of activities of the students (parental involvement); there should be partnership among homeroom advisers and the rest of the faculty staffs to help students budget their time in studying so that they will have specific schedule for their subjects, extra-curricular activities and for leisure activities (collaboration); teachers most specially the homeroom advisers should widen students’ awareness of the advantages one can get from attending classes regularly, and studying his lessons habitually; parents to explain to their children the significance of education and the fruit of education for their future life and to give more attention and care to their children and encourage them to willingly and enthusiastically to cooperate with school administrative staffs and homeroom advisers in solving their problems in school; administrators to publish test schedules ahead of time; the whole school staffs to employ remedial classes to the disciplines revealed where failures occur most often; guidance counselors to reinvent and redefine guidance services in the school to suit the need of learning at present; and for the principals to accommodate supervised and guided study period across the curriculum. This study somehow addresses the pressing needs of bringing education reach the learners passion for learning at hand in an effort to improve their academic marks while disclosing quality offshoots of classroom experiences. In like manner, administrators of the five vicariate high schools including those in the public schools will help them weigh all circumstances to prioritize needs in schools that will identify and facilitate maximum learning programs, and atmosphere conducive to learning. This will excite them too to initiate greater effort in designing functional guidance program which includes services substantial to students to ensure most favorable learning in school. For the teachers, who are in direct contact with the students in the classroom, that this study will help them identify areas where they need to improve teaching styles. Moreover, this article motivates them seek new methods and procedures in realizing their lessons in the classroom. In this reference, the Philippine Commission to Survey Philippine Education for National Development recommended a strong implementation of guidance services in all high schools nationwide. Result of the recommendations encouraged many schools to employ trained counselors in an effort to help learners with emotional problems cope up with the basic requirements in the course. In such case, learners who lack motivation in schooling may somehow feel the importance of education when efforts were taken up to understand their whole personality in the corners of the classroom. More importantly, failures in schools when neglected may cause greater destruction to students’ future. This is because of the direct relationship between failure and interest. Nevertheless, the art of teaching includes the art of guiding and humanizing. It takes enormous struggle for an educator to consider his role to bring the periphery of learning within the context of best learning styles in the global community. It's an amazing article designed for all the internet viewers; they will take advantage from it I am sure.